I am trying to do something everyday when it comes to drawing or painting. 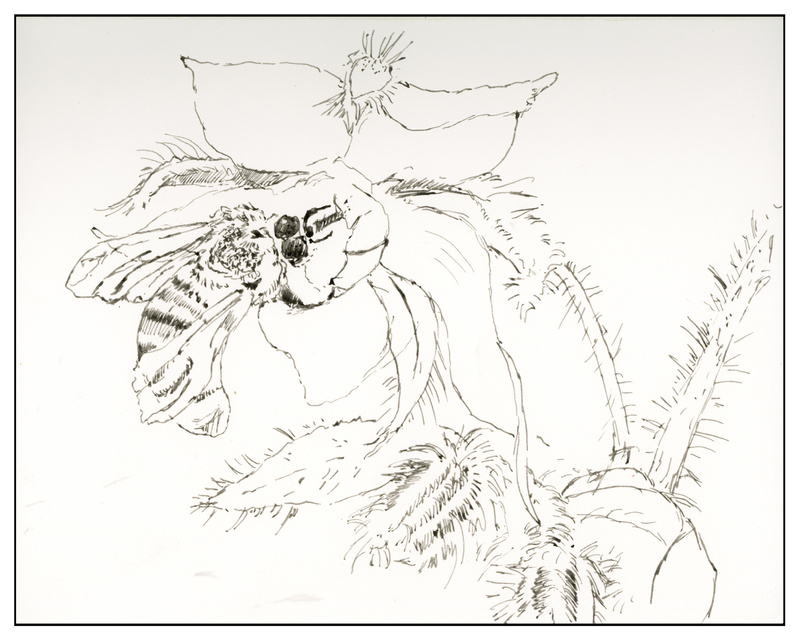 Some days only allow for morning time, and that is when I did this drawing of a bee in a borage plant. Today, I used a dip pen, my ca. 1810 pewter ink well, and iron gall ink. I have never drawn a bee before, and using a dip pen and focusing on the shapes, rather than what I think I see (thank you, Sharon, for that great advice! ), produced fairly decent results. I’m rather afraid to draw anything that requires a bit of realism as I really doubt my abilities to do this. Practice is needed here! Borage is a lovely plant, covered in fur, with beautiful blue flowers. If I recall, it is an invasive plant, and one best kept contained in a pot. I had some in my dog free zone (DFZ) this summer amongst the lilies. As an aside, I’m getting used to using a dip pen, which is really a rather nice skill to have as I don’t have the big blobs I used to get; I know when to refill the well and dilute the ink with water. Something we don’t think about in this day and age of non-dip pens. Thanks, Sharon. I hope that the watercolor will work with it nicely. We’ll see!